Ships dock at Harniskai, about 1.5 km from the historic old town of Flensburg. Turn right from the dock and walk along the harbor in north direction to get to 2 museums and a historic harbor, one of which is the Rum-Museum showing the details of the period that Flensburg was Danish and rum was imported from the Danish West Indies. Most rum-houses where the rum was elaborated into a finishing product, do not exist anymore but in the museum, you can see how they worked. The national and famous motorway network are known as autobahnen, officially there is no general speed limit, but, in an attempt to increase safety and control the pollution, a lot of segments have speed limits (which are strictly controlled). If you rent a car, make sure you stay in the right lane at all times, except when passing! Speeds of 200km or over are not uncommon. Taxis are dependable but expensive. Große Straße („Big Street") makes an impression, not only with its wonderful baroque, classical and renaissance facades; you will discover the biggest assortment of exclusive and proprietary run ladies' and men's outfitters. Relax after shopping at the Nordermarkt (Northern Market) and its many cafés and restaurants. 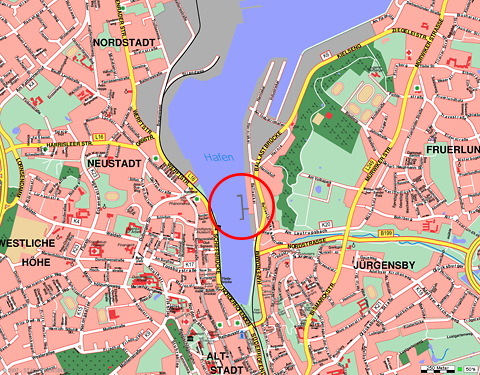 In Flensburg meals are enjoyed out in the open as often as weather permits, preferably by the water. At both sides of the harbor various restaurants and cafés offer delicious fish dishes, besides a magnificent view and beautiful patios. At the Nordermarkt (Northern Market) taverns and cafés huddle close to each other. In summer this is the place to see and be seen. Ancient and cozy restaurants, taverns and wine-houses with specialties from all over the world are to be found at courtyards, atriums and in back alleys in the pedestrian district on both sides of the streets as far as to the Rote Straße (Red Street) at the Südermarkt (South Market). Be sure to taste the famed Flensburger Draft Beer or a glass of fine wine.